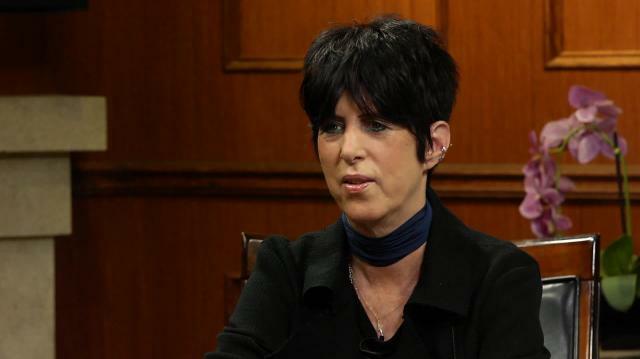 Legendary songwriter Diane Warren joins Larry for a wide-ranging conversation about her decades-long career, the incredible line-up of artists she's worked with — including Whitney, Adele & Celine — and her most recent anthem 'Til It Happens To You,' which addresses the perils of sexual assault in America. Diane also weighs in on the ongoing legal battle between pop star Kesha and producer Dr. Luke. Will Diane Warren have songs on Lady Gaga’s new album? "You know, I don't because my family wasn't musical, so it just kinda happened. I'm kind of a mutant I would say." — Diane Warren on where her musical inclination came from. "A friend of mine, Bonnie Greenberg, was the music supervisor on [The Hunting Ground] and she told me the stories. The movie wasn't done yet, like I didn't see footage actually, but she told me what went on with these girls, and it was just kind of horrifying. I'd had my own experience with a situation in my life and I thought, you know, I'm going to write a song about this." — Diane Warren on writing her song “Til It Happens To You” and how she got involved with “The Hunting Ground”. "What I really want is song to take a life of it's own, and it could be whatever, especially with a song like "Til It Happens To You". It could be about anything, it could be about if you're bullied, it could be about if you go through something terrible in your life where everybody just goes no it takes time and it'll be ok. Well, when you're going through that you don't feel that. "— Diane Warren on what she wants her song “Til It Happens To You” to symbolize. "I feel terrible for her. She's really, you know, she's the real deal. You can't tell with some of the records she's made, but she's a real artist." — Diane Warren on Kesha and her lawsuit against Dr.Luke. "In my experience, yes because it's all about the song. I think where it's not equal is like record producers...You don't see a lot of women record producers, it's like women directors. I can't even name one." — Diane Warren on if songwriting is an equal playing field for men and women. "You know, I still don't. It's weird, like I know I have, but I think in my mind I don't feel like I have. I think it's cool in a ways because it keeps you hungry. I know I have, but I just feel like I'm just beginning... I feel like I'm still the kid from Van Ives that hasn't had a hit yet." — Diane Warren on when she knew she made it. "It has to start with the song being somewhat quality, catchy, but there's a lot of things that go into it too. It has to be promoted, I mean you could have the best song in the world, the hugest hit, if a label isn't behind it nothing's going to happen to it." — Diane Warren on what makes a hit song. "But it's always been a singles market. It started as a singles market." — Diane Warren on if the music industry has changed. "She's great, you know, she's the real deal. And that's the thing about Gaga, her discipline, her work ethic, her talent." — Diane Warren on working with Lady Gaga. “I'm not somebody who dreams up songs and goes oh let me write that down. I have to kinda work at it." — Diane Warren on her songwriting method. "What a sad situation, and one of the best artists historically, of all time, there will ever be." — Diane Warren on the death of Prince. "My one experience with him is I wrote a really big hit for a girl named Paloma Faith and it was his favorite song, he really loved the song and his manager called and asked if he could buy it, he wanted to rewrite the lyrics. I go no he doesn't have to buy it, you know, it's not for sale, but he can do whatever he wants with it and do his own version and stuff. And then I didn't hear back, but I guess live he was performing it all over the place and I tracked it down." — Diane Warren on her experience with Prince. "It's just sad when you think of Prince or [Whitney Houston] or [Michael Jackson]. It's so tragic that all in their prime, when they had so much more, you know, they had so much more to give. None of these artists were at their... over yet." — Diane Warren on untimely celebrity deaths. "I found that some of my experiences, the bigger the artist, the more talented, the nicer they are...And then someone with a little teeny bit of success are like a**holes." — Daine Warren on working with different artists. "They'd probably be surprised that I don't listen to a lot of music... When I go home I don't, because I've been doing it all day. I'm kind of immersed in it from morning till night." — Diane Warren on something people would be surprised to know about her. "A friend of mine came to me and told me about this Michelle Obama project and would it be ok to use the song. I'm like, you kidding me? So we approached all these artists and you know, some said no, but enough amazing ones said yes. I have Missy Elliot rapping on my song, that's big." — Diane Warren on the song “This Is For My Girls” performed by Michelle Obama. "Stop all animal cruelty. Which means stop eating animals, stop displaying them." — Diane Warren on her wish for the world. "Till It Happens To You"." — Diane Warren on what she considers her best song to be. "Amazing, again we were talking about the people that are the most successful being the nicest. She was nice and she worked hard. That's something that some of these people have, I mean the work ethic. If you take Lady Gaga, or [Celine Dion], or Beyoncé, their work ethic is just on point." — Diane Warren on working with big name artists.